iTunes is available for installing on both Windows and Mac OS. As the largest and most popular media store, iTunes owns a huge amount of media files for downloading, such as songs, movies, TV shows and so on. Though most of them are charged with price on different scales, free video clips and movies are offered periodically in iTunes Store. Let us follow the below steps to find and download these free iTunes videos for watching. 1. Download and install correct version of iTunes according to the operating system of your computer. 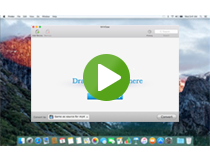 Click "Start" on Windows or go to the Application folder on Mac to find and launch iTunes. 2. 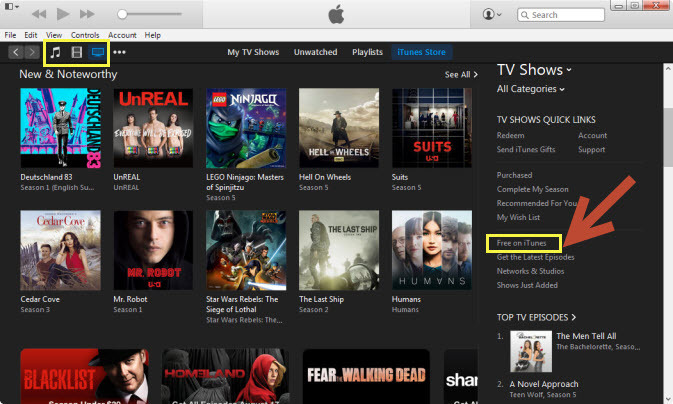 Click "iTunes Store" in the upper right and it will show itself as the main window of iTunes. 3. Press the "Music" or "TV Show" icon on the upper left Menu. 4. 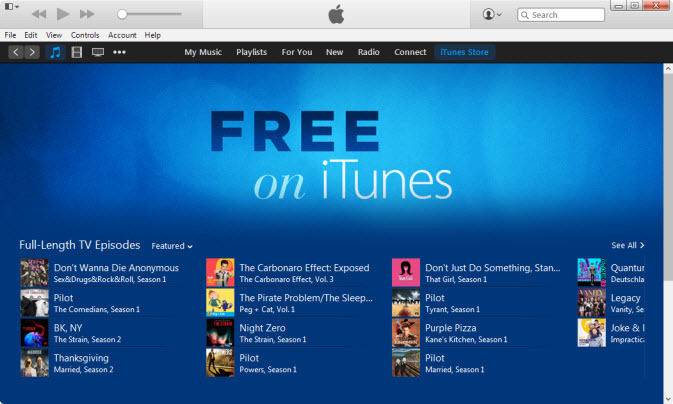 Find and choose "Free on iTunes" in the right column. You will see on the main window a list of current free media, including free songs, and free TV episodes. 5. Choose any movie to see its description and decide whether to download it. According to Apple, the downloading time for a 45 minute video on a broadband connection ranges from three to 20 minutes. 6. Connect your iPhone, iPod or iPad to your computer via their USB syncing cable. Then the free Movies you download on your computer will be transferred to the device automatically so that you can watch them anywhere you want. If you have Android or Windows-based devices rather than Apple devices for the free Movies to be transferred, you need to do as follows to make it. We all know it is the Fairplay DRM in the iTunes movies that prevents them being copied and transferred to non-Apple devices, even though these are free iTunes videos. Therefore, to transfer them to non-Apple devices, removing DRM from them is necessary. Let us first remove DRM from iTunes free movies before transferring. Step 1: Download and install the fastest and most powerful DRM Removal Tool - M4VGear DRM Media Converter. Step 2: Import downloaded iTunes free movies from iTunes library to M4VGear by click "Add Movies" button on the main window of M4VGear. Step 3: Connect your device to the computer and choose it as the output folder for the iTunes free movies. Step 4: Click “Convert” button to start the DRM removing process. The downloaded iTunes free movies will be converted one by one to unprotected MP4 videos, and then appear on your connected device. Now, take iTunes free movies on your non-Apple devices to anywhere for enjoying. Support the latest iTunes version and Mac/ Windows platform. Purchase M4VGear DRM Media Converter with $44.95 (get 5 off) by visiting M4VGear Store now.